ST. GEORGE — Aggressive action from firefighters coupled with some precipitation and moderated weather patterns have allowed fire resources to make a great deal of progress in their efforts to contain and control fires within the Color Country Dispatch area. Over the last few days more than 4000 lightning strikes have been recorded within the dispatch area. Below is a list of fires and their status as of noon today. Middle Ridge—Part of the MGC Complex—Actively Burning. Fire size to date:10,343 Acres. Contained: A fire has had the entire perimeter worked by firefighters, and its forward spread has been halted. Controlled: A fire has been mopped up and no longer deemed a threat. Out: No smoke has been seen on the fire for a 24 hour period. monitor status: Fires are usually located in terrain that is too dangerous for firefighters to access. Those fires are monitored by aircraft to ensure fire resources are aware of any fire activity. 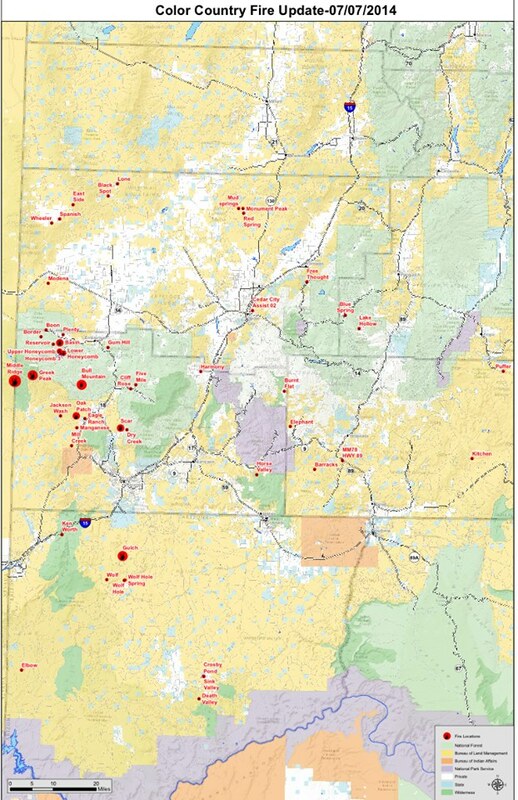 Fire managers have released this information to keep the public informed, but have requested that the general public stay out of the areas where fires are burning for their own safety and to minimize the chance of people interfering with suppression operations.